A stunning bedding set that uses exquisite embroidery & a beautiful broderie anglaise lace trim. Small flowers are embroidered all over the duvet cover, and the stunning lace detail is also on the pillowcases. Available in either white or cream, this set uses a luxuriously soft cotton blend fabric. Sold as 1 x Luxury Duvet Cover. 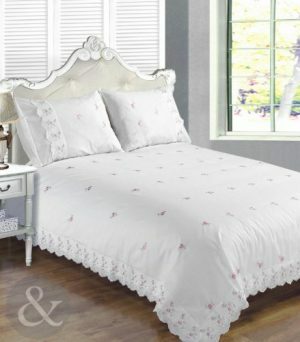 A stunning bedding set that uses exquisite embroidery & a beautiful broderie anglaise lace trim. 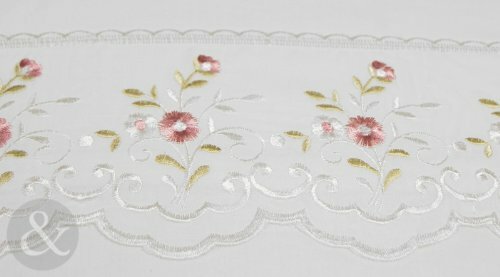 Small flowers are embroidered all over the duvet cover, and the stunning lace detail is also on the pillowcases. Available in either white or cream, this set uses a luxuriously soft cotton blend fabric. Sold as 1 x Luxury Duvet Cover. Material: 50% Cotton, 50% Polyester. Pillowcases are included with the duvet cover. Single includes 1, double, king & super king includes 2 pillowcases. Machine washable.